Mission Statement: A relationship driven, cattle feeding service dedicated to serving agriculture through the stewardship of God’s recourses. Shawn Tiffany graduated from Kansas State University in May 2000. He has an extensive background in the cattle industry working for companies such as Black Diamond Custom Feeders, Lindsey Land & Cattle and Chair Rock Angus. Shawn is a certified A.I. Technician and proficient in Reproductive and Carcass Ultrasound. 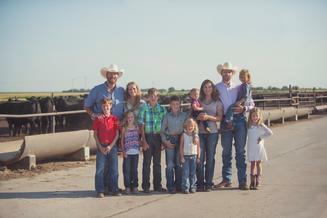 As co-owner of Tiffany Cattle Co. his primary day to day duties are to handle the farming and grain inventory side of the business, as well as assist in cattle health and feeding management, marketing and financial aspects of the business operations. Tiffany Cattle Co. has grown their farming acres through additional leases Shawn has negotiated rounding out a complete service for their customers. Shane Tiffany graduated from Kansas State University in 2001. He has worked with Bartlett Cattle Company where he served as Risk Manager. As such he operated the Hedge Desk hedging all cattle purchases on the Chicago Mercantile Exchange, calculating bids used in the purchasing of cattle, and performing numerous research projects. He served as head of Cattle Procurement in the Northern market where he was responsible for all order buyers in that region. As co-owner of Tiffany Cattle Co. Shane has developed country trade in surrounding areas and addressed all cattle purchasing needs of the feed yard. His primary day to day responsibilities include overseeing office activities, feed and inventories, as well as providing risk management and marketing services for their cattle customers. Together, as brothers, Shawn and Shane strive to provide a family-oriented work environment while acquiring the greatest opportunity for their customers to be profitable and producing a healthy and sustainable product for the public consumer. Their faith in God has led them to put integrity behind the stewardship of their business and resources as a main priority.